The OTC performs gas metal arc and flux core welding, and navigates on a 7-axis system, rotating the material as it welds. It operates on Windows XP software, has a total reach of 74”, rotates 360°, and has two separate stations for material setup. 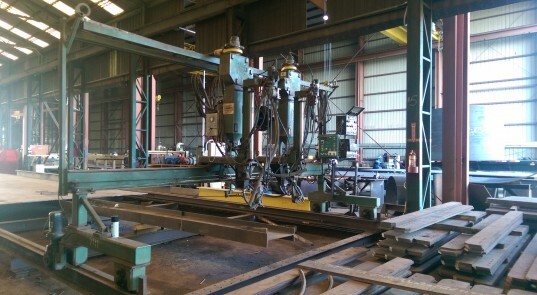 The dual station process allows material to be staged in one station while the robot welds in the other, reducing down time. The removal of rust, mill scale, dirt, or other contaminants is a basic requirement prior to steel surface coating. TTI-FSS wheel-a-brator is a 14 wheel blast cabinet that is capable of producing an SP-5 white metal blast at 2’ per minute. 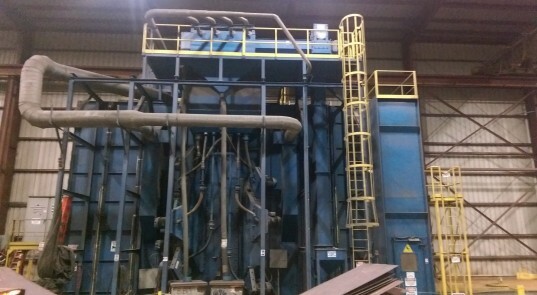 We are capable of running material up to 16’ in height and 7’ in width through this machine on our cart system. The drilling and cutting of materials is one of the most overlooked functions critical to the success of any project. 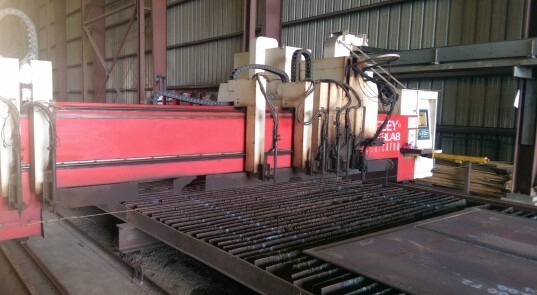 The Farley Laserlab burn machine is capable of burning 12’ wide 140’ long material. It is equipped with a multi-tool drill body that can be used in sequence with its plasma cutting torch and seven oxyfuel torch heads. The MAV 3070, manufactured by Promau-DAVI, the leading brand for plate rolling machines was selected for its design, technological advancement, and effectiveness. The DAVI is the only variable axis roll that has the ability to tilt both the top and the lateral rolls enabling the machine to form the most inclined cone shapes. 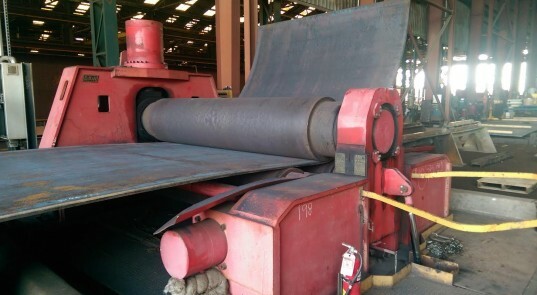 Pre-heated, 7” thick steel can be rolled to approximately 72” ID, and unheated, 4” thick steel can be rolled to approximately 60” ID with a width max. of 10’. Currently, TTI-FSS is the only fabricator in the US to use the electro-slag welding (ESW) technique for bridge work. Total time for splicing a two-inch thick plate into 24 inches wide takes about six to seven hours, where as conventional welding can take 22 hours. 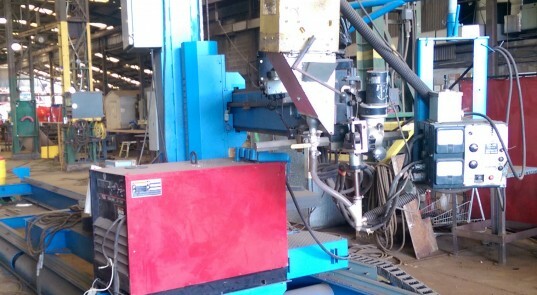 TTI-FSS has three SAW welding manipulators. We are capable of welding the exterior of 15’ diameter tanks or rolled plate. 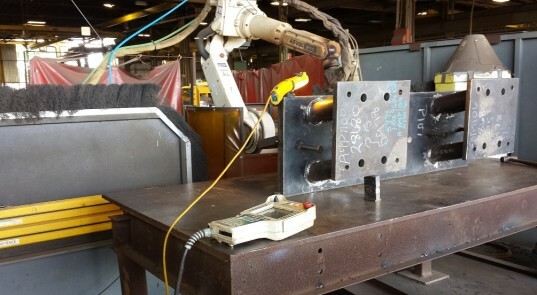 Our internal manipulator can be used to weld the interior seams on large pipe and rolled plate. All three are set up on track systems for maximum versatility. 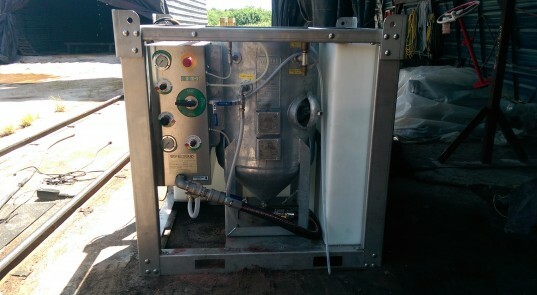 The Ecoquip Vaporblast unit is a environmentally friendly alternative to conventional hand blasting. It reduces dust by 97% compared to traditional blasting. It also uses environmentally-friendly blast media at a 50% reduction in volume while maintaining productivity and quality of blasting.